When you put the right tool in the right hands, great things can happen. In the case of Central Valley’s Ag Department, the tool is a new Syncrowave welder that was awarded by Farm Credit Services after one of its instructors, Lesley Dugan, applied for and received an FCSAmerica grant. The welderwhich is valued at over $2,600 was one among several Farm Credit gave to local community schools to help enrich their curriculum. Dugan said there’s a huge job market out there for experienced welders and the pay is good. She added that almost every business and industry today—including those beneath the ocean and even some in space—need welders. “With the experience our students get here, they can leave high school with entry level skills, go to CCC, and become certified,” she said. “From an employer’s perspective, that means they can spend less time training new workers and more time having them be productive.” She said that amounts to a “win-win” for both the students and their employers. ​Julia Wright, who has taught welding for over 10 years, said there are really no limits to what a qualified welder can do. Some artists who are especially skilled at the trade have created metal art sculptures. Others might create custom vehicles worth millions of dollars for Hollywood movies. Wright said her students use various types of welders in both their Welding and their Metals and Fabrication classes, including oxygen/acetylene rigs, MIG—or wire welders, and arc—or stick welders, but the TIG is especially useful on metals like aluminum and cast iron. “In our area of the country, we use the TIG mainly to weld aluminum irrigation pipe,” she said. 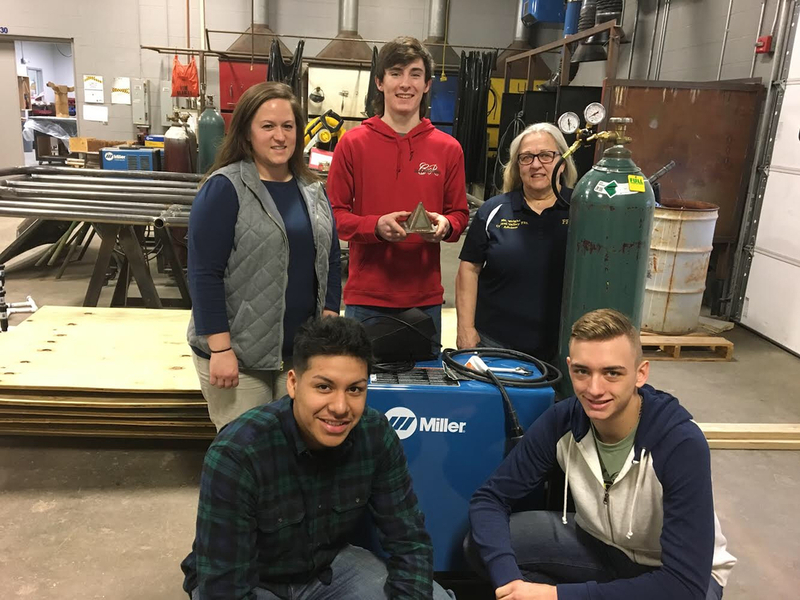 ​Dugan said, “As teachers, our purpose is to align ourstudents with the most current technology we can provide.” She said the TIG welder they received allows them to do just that. “Using this technology, we try and simulate an actual workplace environment when we teach. For example, we give our students a blueprint plan to follow, then, after they study the drawings and symbols, they’re set to physically and independently begin welding something.” She said through the years, their seniors have made everything from grill guards and cooking grills to a full set of cattle panels. “We’ve had some extremely skilled welders over the years,” Wright said. “In fact, several of our students have gone on to major in welding in college.” She said as a testament to their students’ talents, their FFA members have qualified for the State Welding Contest every year for the past eight years and they hope to again this year. She noted that in 2020, TIG welding will be made a part of the competition. “I feel certain Central Valley will be up to the challenge, thanks to the generosity of Farm Credit Services,” she said. ​Along with furthering their welding skills, Wright said the experience students get from working with a high-tech tool like the TIG can give them added confidence when they apply for a job. “We know when kids leave here, it will be with career ready skills,” Dugan added.